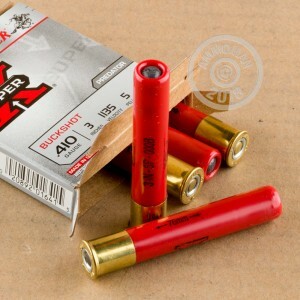 This 410 bore shotshell ammunition from Winchester's Super-X series packs five pellets of large 000 buck into a 3-inch hull. Moreover, it fires them at a muzzle velocity of 1,145 feet per second, making this one of the more powerful 410 bore loads available. 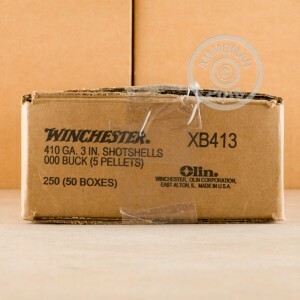 These shells are suitable for use in magnum 410 bore revolvers such as the Taurus Magnum Judge. Each box contains 5 rounds. 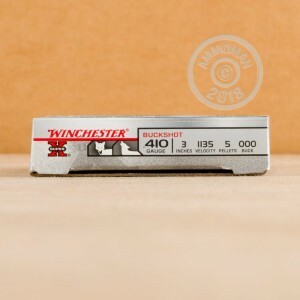 Winchester shotshells are loaded in Oxford, Mississippi using reliable 209 primers and one piece hinged wads that help with both patterning and recoil. All orders over $99 at AmmoMan.com ship for free!